U.S. Secretary of State John Kerry is once again in town trying to reach a framework agreement between Israel and the Palestinian Authority. One of the issues of dispute is the fate of the Jordan Valley, which is indispensable for Israel's national security. The Jordan Valley is the only available defensible border on the eastern front, which is the closest border to Israel's heartland -- the Jerusalem-Tel Aviv-Haifa triangle -- which holds 70 percent of its population and 80% of its economic infrastructure. Many pundits claim that Israel no longer needs the Jordan Valley as a shield against aggression from the east. They argue that the demise of the Saddam Hussein regime in Iraq, the weakening of civil-war-torn Syria, and the impressive stability of Jordan in light of the turmoil of the Arab world renders the threat of the eastern front and its proximity to Israel's center a thing of the past. Yet this is a very short-term perspective, motivated by the desire to convince the Israeli public opinion that the Jordan Valley is militarily dispensable. Such a view ignores the immense potential for political upheaval in the Middle East, as recently demonstrated during the Arab Spring. The destabilization of Hashemite Jordan and Saudi Arabia and a radical jihadist Syria are not far-fetched scenarios for the near future. The re-emergence of the eastern front as a security threat could soon follow. Moreover, the U.S. decided to cut its losses and leave Iraq and Afghanistan, which constitutes a victory to all radical forces in the Middle East. A more energy-independent America might decide that it has less of a stake in the Middle East, allowing greater freedom of action to Islamist elements to take over American allies. Israel cannot count on the U.S. to always lend its weight to Arab moderates. Under President Barack Obama, Washington supported the Muslim Brotherhood in Egypt and might make the same strategic mistake in Jordan. Advocates of turning over the Jordan Valley to the Palestinians also discount its topographical importance by referring to current military technology, which allows precision strikes from a distance. 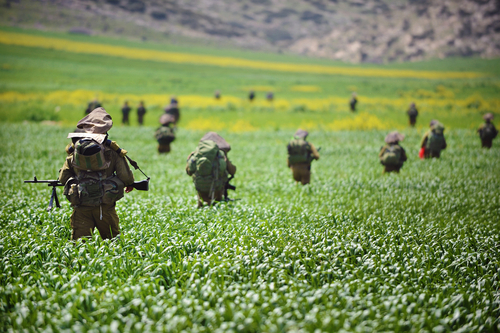 They argue that the ability to launch defensive strikes from the coast eliminates the strategic need for the Jordan Valley as a means of defense. Yet, these armchair strategists overlook the history of military technology, which shows a clear oscillation between the dominance of offensive and defensive measures over the centuries. The belief that the technology of today -- which indeed temporarily reduces the importance of topography -- will remain unchallenged constitutes a dangerous strategic fallacy. Designing stable defensible borders in accordance with the current, but transient, technological state of the art and political circumstances is strategically foolish. Therefore, if Israel wants to maintain a defensible border along the Jordan Valley it also needs to secure the road from the coast to the Valley, via an undivided Jerusalem and via Maaleh Adumim -- 15 kilometers (9 miles) from the river. This is the only west-east axis with a Jewish majority and the only safe route via which Israel can mobilize troops from the coast to the Jordan Valley in a case of emergency. Maaleh Adumim serves as the linchpin in establishing an effective line of defense along the Jordan Valley against aggression from the east. Building a Jewish populated corridor in the 5-kilometer-wide E1 area between Jerusalem and Maaleh Adumim will secure the road to the Jordan Valley and prevent the division of Jerusalem. Jerusalem's importance to the Jews is not only historical and religious, but also strategic. There is great importance in controlling the only highway from the Mediterranean to the Jordan River Valley along which Jews can travel with little interference from concentrations of the Arab population. The Palestinians plan to populate E1 with Arabs to create demographic contiguity between Samaria and east Jerusalem, thereby facilitating the division of the city. Such a development would also isolate Maaleh Adumim and undermine Israeli claims to the Jordan Valley. Settling Jews in E1 is an imperative to keep Jerusalem united and to consolidate Israel's defensible border along the Jordan Valley. The U.S. seems to understand Israel's strategic need for the Jordan Valley, but is opposed to linking Maaleh Adumim to Jerusalem as a vital component of the eastern defensible border. Yet, we should remember that the U.S. has opposed Israeli settlement efforts since 1967 and only rarely did American objections have an impact on Israeli decisions on this issue. Moreover, the Americans can be persuaded to tacitly go along with linking Maaleh Adumim to Jerusalem if a clear strategic vision based upon the principle of territorial compromise is presented. While the wisdom of indiscriminately settling the Land of Israel is not strategically compelling and is a hard sell diplomatically, a selective settlement policy focusing on areas within the Israeli consensus, including Maaleh Adumim and the Jordan Valley, can be pursued with less foreign opposition. Willingness for a territorial compromise in Judea and Samaria is also the position of most Israelis. The government must act to reflect this preference to convince the Israeli public that it is seriously pursuing peace. Israelis need such an assurance to support the government in case of international pressure to make dangerous concessions, or to fight a war if necessary. A selective settlement policy that distinguishes between important and less important strategic areas requires a gradual freeze in building and allocations to isolated settlements, and should be complemented with the removal of illegal outposts located outside the areas of consensus. Building in E1 and the Jordan Valley will thus become easier in domestic and international terms. It is imperative to build homes for Jews there to establish a defensible line along Israel's eastern border. Hopefully Prime Minister Benjamin Netanyahu will finally implement the announced plans.